The Society welcomed Martin Berry from Warrington Photographic Society, founded in the 1880’s making it one of the oldest Photographic Societies around (LAPA/SLPS was founded in the 1850’s). Martin gave us a valuable insight into the running and rules of the early Society and included some great early images, of the Warrington Membership of the late 1800’s and early to mid 1900’s. It was so good to look back to an earlier photographic era in time, and view digitised images of local Social History including the fashions and architecture of the day, through the original ‘lantern slides’ of the Society. 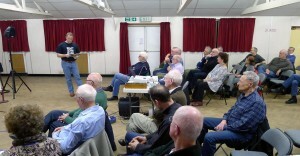 Martin Berry, introduces himself to the Society, and reads a few of the original rules regarding the Amateur Status, of the early membership of Warrington Photographic Society. Early members could be expelled from their Society, if they made ANY money or money from borrowed Warrington equipment….